For the distinctive look and feel of velvet. Deco-Flock™ adds perceived value to logos, numbers, letters and designs. It provides the 3-dimensional look and feel of soft velvet in an affordable, durable, and wash-safe transfer film. You can also adhere it atop our ThermoFlex® materials for added dynamic effect. 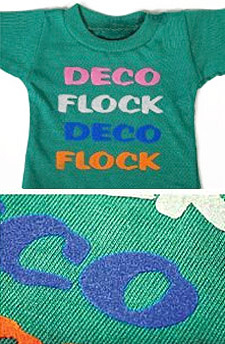 Deco-Flock™ offers your customers a lower cost alternative to embroidery for the look and feel of distinction. Its mid-range transfer temperature (320° F - 340° F) hot-melt adhesive will attach to most fabrics including some temperature sensitive ones, including some nylons. Since fabric characteristics vary, test before using in production.